Microdermabrasion VS Chemical Peels - Which Is Best? Microdermabrasion is a mechanical / non-chemical, skin resurfacing procedure that removes the stratum corneum, the outermost layer of skin that is often mistaken for a build-up of dead skin cells. Microdermabrasion involves spraying tiny crystals or grains onto the skin to exfoliate the outer layer. The body interprets microdermabrasion as a minor injury to the skin, which activates the skin’s healing processes. This helps to reveal younger, healthier-looking skin, as well as to encourage the production of a new underlying layer of skin cells. Microdermabrasion helps to enhance the production of collagen and elastin. These are the main proteins that make up the skin and that keep it looking and feeling youthful. Microdermabrasion is, therefore, a useful skin resurfacing treatment for fine lines and wrinkles, such as “crow’s feet,” as well as for mild acne scars and superficial hyperpigmentation. Microdermabrasion is much gentler than dermabrasion and does not cause changes to skin pigmentation. This means that microdermabrasion is suitable for people with darker skin as well as those with fair skin. Dermabrasion is a much more intensive procedure that removes deeper layers of tissue. Practitioners use dermabrasion to treat deeper facial lines, extreme sun damage, and scars. Dermabrasion is not suitable for all skin types, however, as it can cause a loss of pigmentation in darker skin. Several types of microdermabrasion treatment are available, including crystal microdermabrasion and diamond microdermabrasion. Each type has pros and cons. Crystal microdermabrasion has been around the longest. This technique involves spraying fine crystals over the skin to abrade the surface layers. A vacuum is used simultaneously to remove the crystals and exfoliated skin cells (corneocytes). Microdermabrasion crystals are typically made from nontoxic aluminum oxide or organic sodium bicarbonate. The practitioner disposes of the used crystals after each session. Crystal microdermabrasion can be a little messy and will generally leave some residue on the skin. Diamond Tip microdermabrasion uses a wand with a tip made from natural or synthetic diamond chips. This method is particle-free and offers more control and accuracy, which is why most therapists and aestheticians prefer diamond microdermabrasion. Diamond microdermabrasion wands also have attached suction, but differ in that they make direct contact with the skin. For health and hygiene reasons, the practitioner must sterilise the diamond-tips before use with a new client. The use of suction in this type of microdermabrasion also creates a higher risk of damage to the capillaries (smaller blood vessels) if not carefully controlled. Chemical peel is another form of exfoliation, but uses a chemical solution instead of mechanical methods. The practitioner applies an enzyme or alpha hydroxy acid (AHA) solution to the skin to encourage skin cell turnover, and this either dissolves the bonds holding skin cells together or chemically wounds the cell to encourage renewal. The effects of chemical peels become visible in the days after treatment, as the skin cells peel away. In contrast, you can usually see the effects of mechanical exfoliation right away, as the cells are physically removed in the treatment. Dermatoligists and aestheticians use chemical peels to treat a variety of skin conditions including acne, acne scarring, rosacea, hyperpigmentation, photo-damaged skin, lines and wrinkles. They are also used to help resurface the skin for a smoother texture and more even tone. Deep Peels – working down to the papillary and reticular dermis (physician / doctor2only). The strength of a chemical peel solution will vary depending on the type of acid used. The most commonly used solutions are Hydroxy Acid peels, including Alpha Hydroxy Acids (AHAs) such as a Glycolic Acid Peel. Other AHAs include Lactic Acid, Mandelic Acid, and Tartartic Acid. Beta Hydroxy Acids (BHAs) are also used, and these include Salicylic Acid Peels. BHAs are more effective at removing oil from the pores and enhance the penetration of other active ingredients. Chemical peels that work at a superficial depth typically involve the use of enzymes. These are gentler on the skin and are also sometimes used in home skin treatments, such as post-peel masks that aid in post-peel sheathing or flaking. 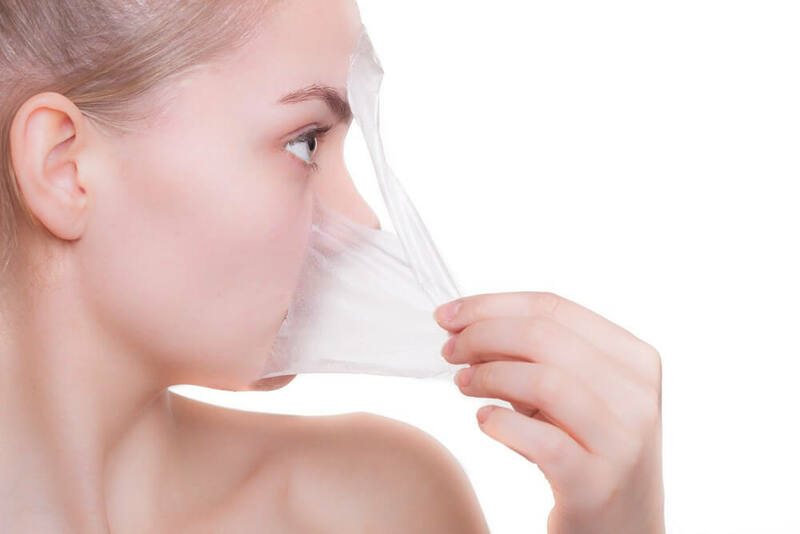 The substances used in superficial, enzyme-based, checamical peels do not typically penetrate very deep into the skin, and are gentler than some other chemical peel solutions. As such, there are minimal risks with this kind of skin resurfacing treatment. Some irritation may occur, and you should expect some flaking of the skin. Stronger forms of acids used in deeper peels include Resorcinol, Trichloroacetic acid (TCA peels) and Phenol Peels. These penetrate deeper and remove the entire stratum corneum. As with any skin treatment, anyone with irritated skin should avoid chemical peels. Chemical peels that use retinol, AHAs, BHAs, or benzoyl peroxide can cause skin irritation and can lead to a higher risk of Post-Inflammatory Pigmentation (PIH). PIH is a condition that creates brown patches of pigmentation following trauma to the skin. The inflammatory cascade can trigger an increase an over-production of melanin leading to areas of hyperpigmentation. Which Is Better, Microdermabrasion OR Chemical Peel? Both microdermabrasion and chemical peels provide resurfacing and regenerative benefits to the skin. Each has advantages and disadvantages. At Medico Beauty Institute we always favour acids and enzymes over mechanical methods of exfoliation. Although gentler on the skin, compared to dermabrasion, microdermabrasion, by its very nature, abrades the surface layer of skin. This physical action of exfoliation removes the outer layers of stratum corneum which compromises the skin’s natural barrier function, puts stress on the skin, and triggers an inflammatory cascade. This allows for greater product absorption and increased cell turn over, thereby encouraging skin regeneration. Microdermabrasion can, however, cause thinning of the outer layer of skin if done too regularly. This can make skin more sensitive and lead to premature ageing and PIH. Remember, the stratum corneum is not ‘dead’. It plays a vital role in protecting the younger cells below. Accordingly, we do not advise regularly removing or compromising the skin’s protective layer. In contrast, while chemical peels also compromise skin barrier function, the effect is subtler and works at a deeper, cellular level. Shedding occurs when new cells migrate from the deeper layers to replace the damaged tissue, as opposed to rushing to replace cells that have been forcibly removed through mechanical abrasion. As such, chemical peels do not cause an immediate improvement in the appearance of the skin. Instead, improvements become visible over the course of a few days following the treatment. It’s important to remember that not all chemical peels fall into the same category. So, when deciding whether microdermabrasion or chemical peels are best for your client, be sure to factor in the type of peel you would use. What’s The Difference Between A Chemical Peel and Metabolic Peel? Traditional chemical peels work by wounding, causing trauma and inflammation to the skin. This is particularly the case with deeper peels that use TCA or Phenol Acid. For a long time, the belief was that the deeper the peel and subsequent wounding, the better the results. We now have a better understanding of the inflammatory cascade, however, and its effects on skin ageing. As such, we now know that a gentler approach is best for achieving and maintaining results longer-term. At Medico Beauty Institute we teach a progressive protocol using ‘metabolic peels’. A traditional chemical peel uses acid to wound and exfoliate the skin from the stratum corneum downwards. Newer Metabolic Peels incorporate encapsulated Retinol to stimulate renewal from the deeper layers, without causing trauma to the skin surface. We believe this is more in line with the skin’s natural metabolic turnover process as it simply increases the rate of renewal and helps to normalise cell behaviour to treat the skin condition. Vitamin A (Retinol) helps to regulate cell function and is a corrective ingredient, as opposed to an exfoliant which only produces short-term effects. For an in-depth discussion of how to safely treat all skin types including darker skins using Metabolic peels, read this CPD Accredited article entitled “Minimising the Risk“. What is a Metabolic Peel? Metabolic Peels includecon a cocktail of different purified Chirally Correct AHA’s such as L-Lactic Acid and L-Mandelic Acid for example. They are also available in acid-free formulations, incorporating Vitamin A, Vitamin C and enzymes. This type of skin treatment may also contain other beneficial ingredients for the skin, such as antioxidants and anti-inflammatory and antibacterial substances. Metabolic Peels infuse the skin with corrective nutrients, as opposed to relying on exfoliation alone. Metabolic Peels are an ideal choice, therefore, for anyone with sensitive or compromised skin, including clients with Rosacea. • Improving cell to cell communication. To learn more about Metabolic Peels and the Medico Beauty Institute safe approach to skin peeling, email us at [email protected] or call us on 0844 855 2499.